Tokyo is home to many educational institutions of international-renown, many of which have their roots in the Meiji Restoration of the latter half of the 19th century. This walk, from Takebashi to Hongo, traces those roots by visiting a number of spots associated with the development of Japan's modern education system as well as the Meiji modernization more generally. Begin from Exit 1b of Takebashi subway station. Take the stairs up to the basement of the Palaceside Building, walk the length of the building and ascend the short flight of stairs to the outside. Just across the street you will see a construction site--the rebuilding of the headquarters of Marubeni. This site was once the home of the Hitotsubashi branch of the Tokugawa family, which provided a number of Tokugawa shoguns, including the last one, Yoshinobu (1837-1913). Turn left and you will see ahead of you the overhead expressway which runs over the Nihonbashi River and, below it, a bridge across the river. Although it's hard to imagine now, 150 years ago a major gate to Edo Castle (now the Imperial Palace) stood just this side of the bridge, which is known as the Hitotsubashi Bridge, and stone walls ascended from the south bank of the river just as they still ascend from the "inside" of the moat around the Imperial Palace. Tokyo Gov Yuriko Koike has proposed putting the expressway under the river, so that the river can once again be exposed to the sky and become a feature of the city. Depending on the tide when you cross the bridge (the river here is tidal), you may observe for yourself that if that happens it will also be necessary clean up the river, as it is now little more than a drainage ditch and can emit some unpleasant smells. After crossing the bridge you are in Tokyo's Hitotsubashi district. During the Meiji Restoration this area was given over to schools and universities and the neighborhood still reflects these academic roots. The entire block on your left was, until the 1923 Great Kanto Earthquake, the campus of Hitotsubashi University, then known as the Tokyo University of Commerce. After the school was leveled by the earthquake, it moved its main campus to Kunitachi but held on to the land. The first building on your left is Josui Kaikan, the alumni club for Hitotsubashi University. The club has occupied this site since 1919, although the current structure is newer. Step inside to see preserved the arched lintel of the original building. Next door is a tall modern building that houses Hitotsubashi Hall (a conference facility) and the National Center for Sciences. Between the two is a small stone monument commemorating the fact that Tokyo Foreign Languages University was here from 1857 until it merged with the Tokyo University of Commerce in 1873. Just across the side street from here is the campus of Kyoritsu Women's University, pioneering women's education since 1886. 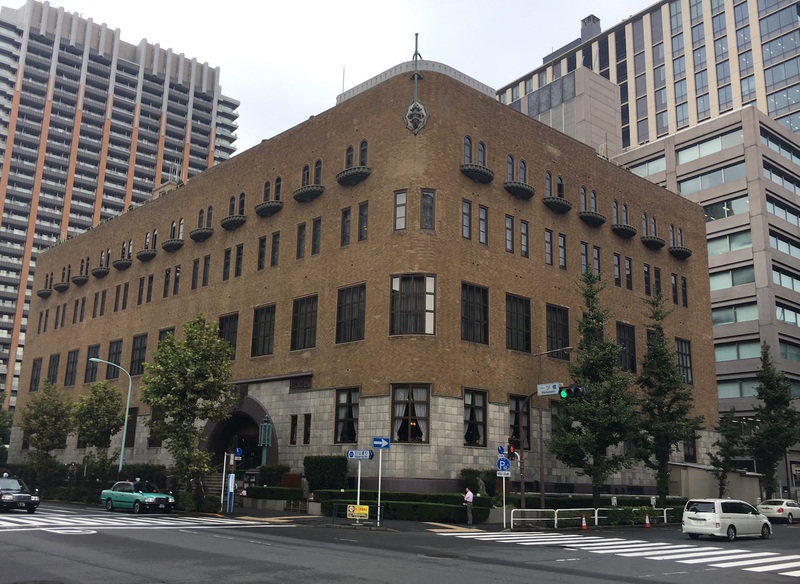 Cross the arterial street (Shirayama-dori) to reach a distinctive 1920s-style brown brick building: Gakushi Kaikan. This entire block was, until 1923, a campus of what is now the University of Tokyo. This site, too, was destroyed by the earthquake, with the result that the university consolidated its campuses at Hongo and Komaba. 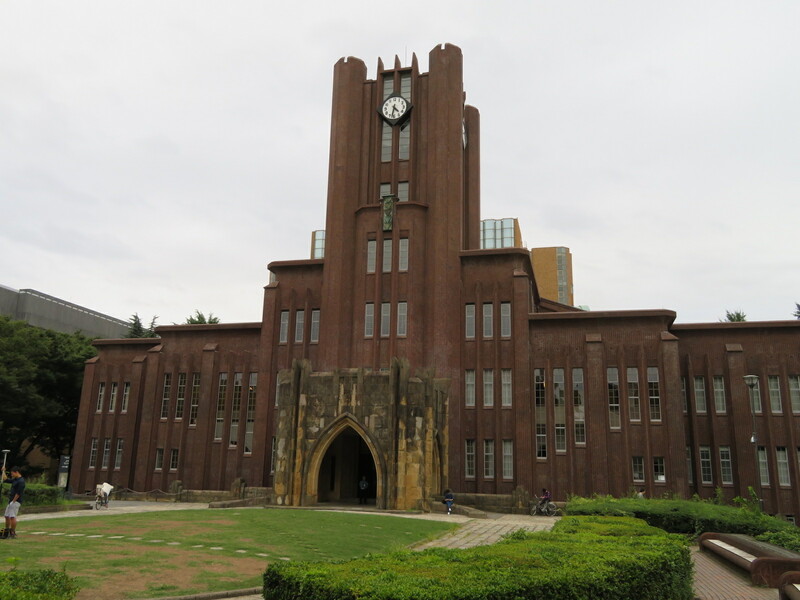 Gakushi Kaikan was raised from the ashes in 1928 and serves as the alumni club for seven national universities, including the University of Tokyo. Before stepping inside, notice the small monument on the south corner commemorating the fact that Joseph Hardy Niishima, founder of Doshisha University, was born on this site in 1843. It is interesting to walk through the Gakushi Kaikan just to soak up its pre-war atmosphere. There aren't many buildings of this vintage left in Tokyo. Gakushi Kaikan operates several restaurants, meeting facilities and a small hotel, as well as reading room and other facilities for members. Exit at the opposite end of the building, near the hotel front desk, and keep heading north. Just at the north end of the block you'll find another interesting monument, this one commemorating a piece of Japanese baseball history: baseball was first played here in 1872. Cross Shirayama-dori again to find yourself in front of Shogakukan, the recently re-opened headquarters of one of Japan's major publishers of children's educational books. In the lobby are displays featuring recent publications. Continue north, passing Shuei-sha, another publishing house, and then the Salvation Army of Japan. Turn left and meander down Sakura-dori, a narrow street lined with small shops and restaurants, including a few of the vintage book shops the Jimbocho area you have now entered is famous for. About 75 meters along on the left you'll find another brown brick building from the late 1920s, now the Thai-Japan Friendship Center (though rarely open). When you reach the end of Sakura-dori, turn right and walk up to Yasukuni-dori. From here, you will turn right and proceed along Yasukuni-dori. If you are interested, first take a slight diversion and return here to continue. Across Yasukuni-dori and about 50 meters up on the left is the preserved original gate to Senshu University, the Kuro-mon or "black gate", distinctive for its Edo Period simplicity. In this Jimbocho area, Yasukuni-dori--and many of the alleyways behind it--is lined with art stores and used book stores. It's logical, when you consider the number of universities and publishing houses in the area. 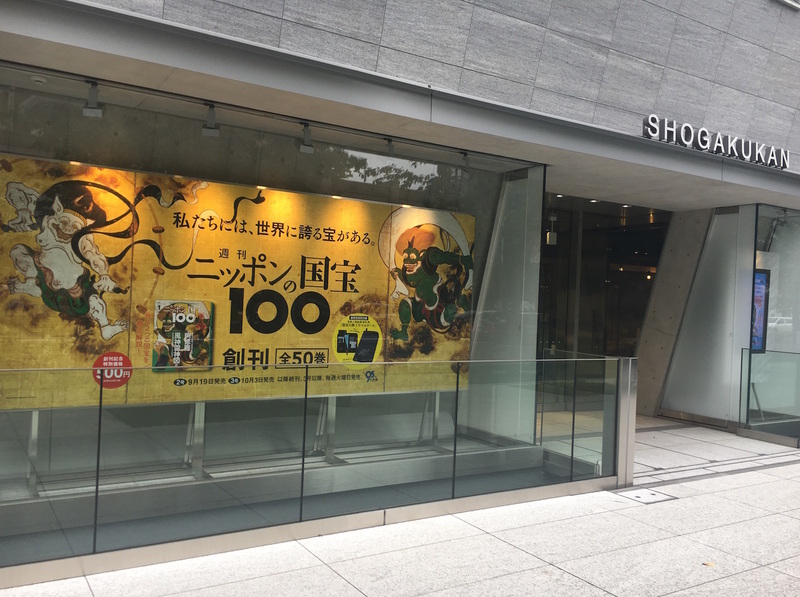 One could spend an entire day poking around in the various shops, many of which have both Japanese and English books, with the English books usually in the back or on the second floor. I've heard there's an entire store dedicated to books in Italian, but I've yet to find it. The most interesting time to visit this area is coming up soon. The Kanda Used Book Fair will be held this year from Oct 27 to Nov 5. 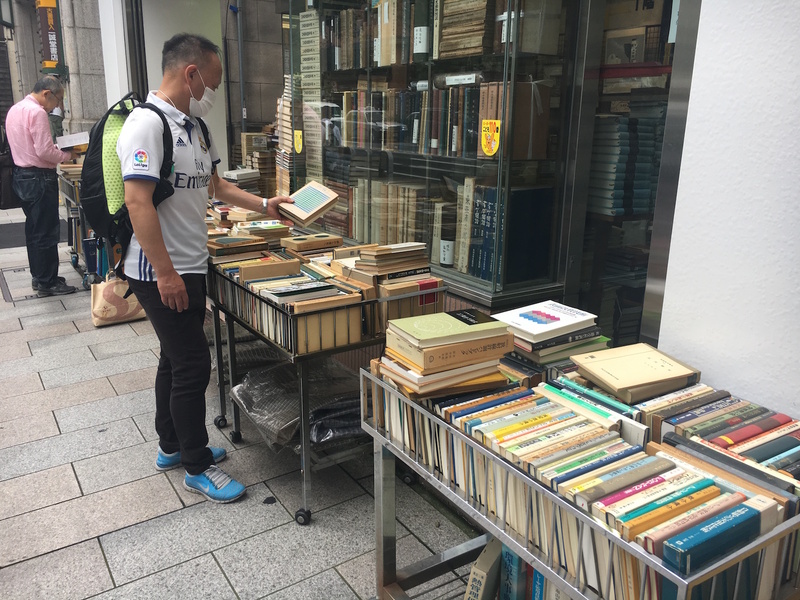 While many booksellers have books in racks on the street whenever the weather permits, during the book fair, many booksellers have special sales and marked down prices. And who can resist that atmosphere of a good used book fair? For now, just soak up a bit of that bookish atmosphere as you walk east until Yasukuni-dori makes a major right hand bend. (There's an excellent antique wood block print store just here on the right-hand side.) Cross Yasukuni-dori at the bend and proceed up the hill, basically continuing east-northeast toward Ochanomizu Station. You'll soon see Meiji University on your left and the Nihon University Medical Center across the street on your right. In the second block of Meiji University buildings, look for the Academy Common building at the top of the stair-stepped open plaza. In the basement of this building is the Meiji University Museum, with its two major collections being "criminal materials" and "Japanese archaeology". These two themes are unrelated and were once two separate museums but were consolidated with the Academy Common building was opened. Nonetheless, both collections have their interesting features, there is an explanatory English pamphlet, you can explore the collection in less than an hour and entry is free. After the museum, take the side street heading southeast toward Nikolai-do, Tokyo's Russian Orthodox Church. You will see the distinctive dome ahead to guide you. When the road tees, turn left then right to find the front gate to the cathedral. 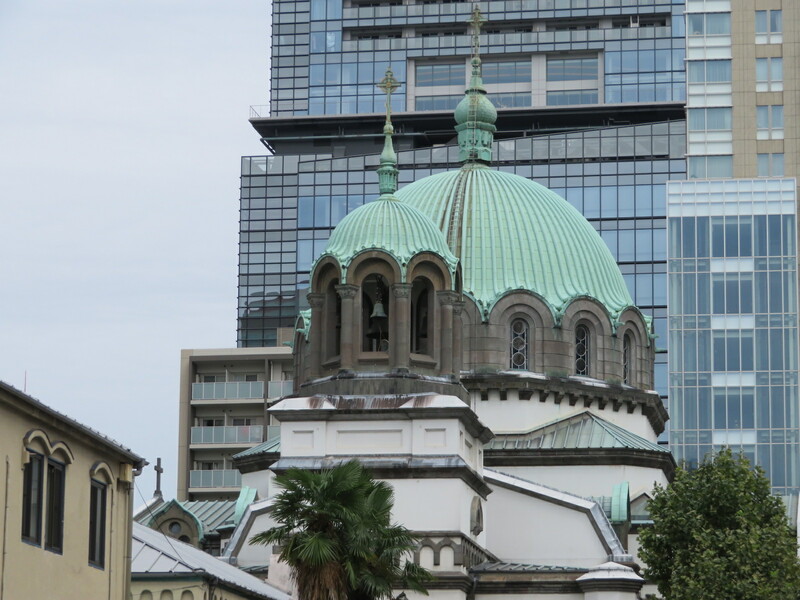 Formally known as the Holy Resurrection Cathedral, but popularly called Nikolai-do after Nicholas Kasatkin (1836-1912), the Russian missionary who preached in Japan for most of the Meiji Period, the cathedral was first opened in 1891. It was constructed by Josiah Conder, the English architect who designed and built many of the Meiji Period's major Western-style buildings. (We'll encounter his work again later in this tour.) While Conder oversaw the construction of the cathedral, the plans were made by a Moscow architect, making the structure truly a piece of old Russia in Japan. The building is usually open to the public for a few hours every morning and afternoon except on Saturdays and Mondays. Non-Orthodox visitors are asked to make a 300 yen contribution, for which you receive an explanatory pamphlet and a candle to light in front of the icon of your choice. On leaving the cathedral, turn right out of the gate, then left at the main road. Go up the hill and, after crossing the bridge, take the staircase on the right to descend to the front gate of Yushima Seido, a Confucian temple that served as a school to train bureaucrats for the Tokugawa Shogunate (1600-1868). The austere black temple is both sedate and soothing. Don't miss the statue of Confucius in the lower section of the temple grounds. Leave the temple by the same stairs as you entered, turn right and cross the next major road. Turn right again and proceed to the outer gate of Kanda Myojin shrine on your left. Founded in 730, this is one of the oldest shrines in Tokyo, although it was moved to this location in 1603 by Tokugawa Ieyasu, from a location in Otemachi that possibly encroached on land he wanted when he was developing Edo Castle. The shrine contains various guardian deities responsible for different neighborhoods of old Edo, making it a significant religious site. 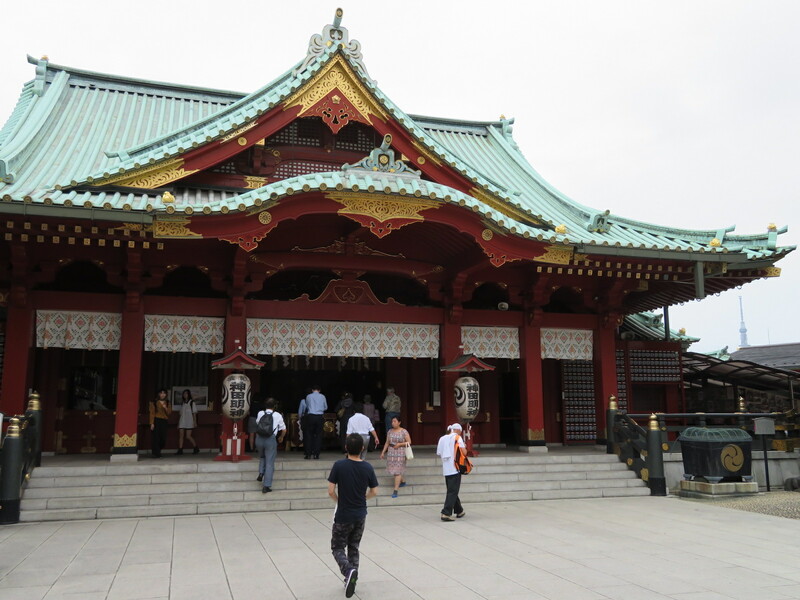 Proceed around to the right of the main shrine building and follow the path toward the back. You will pass by a number of small subordinate shrines and commemorative markers, including one to Zenigata Heiji, a legendary constable who would stop criminals by throwing coins at them, and one to the establishment of Chinese style education during the Tokugawa period. Keep following the path and emerge from the back of the shrine by descending a flight of stairs between two modern buildings to reach Kuramaebashi-dori. Turn left, proceed to the light (Shimizusakashita) and cross Kuramaebashi-dori to the right. Follow the narrow side road for about 500 meters, getting a glimpse of late 20th century central Tokyo, with its medium size buildings and a sprinkling of small shops. At the end of the road you will see the glittering arched gables of Yushima Tenjin shrine. Any tenjin shrine honors the great scholar Sugawara Michizane (845-903), who is regarded in Japan as the god of wisdom and learning. This makes the shrine very popular with supplicants praying for success on their school entrance exams. They often leave their petitions in writing on ema votive plaques which are hung on racks on the shrine ground. Yushima Tenjin's proximity to the Hongo campus of the University of Tokyo means that many who pray here are aspiring to study there. Michizane's favorite flower was the plum blossom and there are many plum trees on the shrine ground which bloom in the early months of the year, just at the time when most aspiring students are offering up their prayers. There are also many cow images on the shrine ground. Michizane was born in the year of the cow and is said to have died on the month, day and hour of the cow. Because of this affinity, the cow is commonly regarded as his messenger. Stroking the large bronze cow statue on the shrine ground is said to cure illness. Leave the shrine by descending the stairs to the right of the main shrine building. The steep stairs are known as the "male slope" and the less steep stairs are known as the "female slope". Proceed straight ahead to the busy road (about 100 meters) and turn left. At the next light (Tenjinshita), cross Kasuga-dori, turn left, take the first right and follow the curving road to the front gate of Kyu-Iwasaki Tei-en. Now a Tokyo Metropolitan Park (admission 400 yen), this former home of Iwasaki Hisaya, the scion of the great Mitsubishi industrial conglomerate, is also a Meiji Period icon. The Western part of the house was designed and built by Josiah Conder in 1896 and was used predominately for entertaining both Japanese and foreign guests. Connected to the Western house is a Japanese house where the Iwasaki family usually lived. 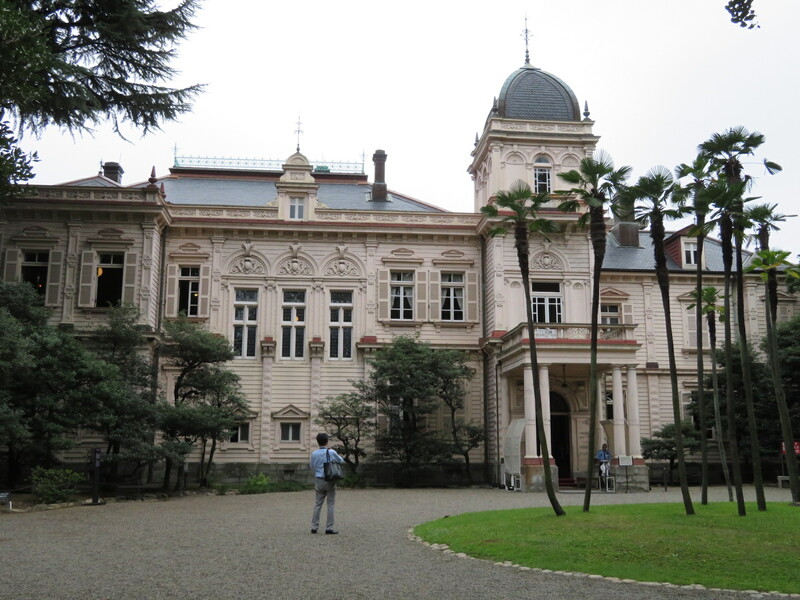 The entire complex was requisitioned by GHQ during the American occupation at the end of World War II and then became the Legal Training and Research Institute for a number of years before being turned over to the Tokyo Metropolitan Government. Visitors can explore most of the house (some sections are off limits) at their leisure. Although it contains very little furniture, many of the rooms have been beautifully restored. The woodworking and wallpaper are especially noteworthy features. In the dining room on the ground floor there is an explanatory video that is very helpful. To avoid getting lost on the way to your final destination, the University of Tokyo (Todai), ask at the ticket booth and they will give you a bilingual map of the university campus and show you how to reach the "Tetsu-mon" (iron gate), one of the back gates. It is only a few minutes walk. With the aid of the map, you should have no problem wandering the hallowed halls of the university. Much of the campus was acquired just after the 1923 earthquake from Marquis Maeda, whose residence here collapsed in the quake. He took in exchange some of the university's land in the Komaba area. There are still two major sights associated with the Maeda family to be seen on the campus: the Sanshiro Pond and Akamon, the famous red gate that was built as a wedding gift when a Tokugawa princess married Lord Maeda in 1827. Save Akamon for last, as you can see it as you leave the campus. Instead, after making your way around the pond, proceed to the Yasuda Auditorium facing the gingko tree-lined lane leading to the university's main gate. This auditorium is perhaps best known for its role in the student demonstrations of the 1960s, culminating in a violent two day battle between students and police in January 1969. These days this section of the campus, with its old brick buildings, is probably the most picturesque part of the campus, belying its history. Exit from the main gate and turn left to soon find yourself in front of the Akamon. Its ornate beauty is a striking contrast to the Kuro-mon outside Senshu University. Keep going to reach the Hongo san-chome subway station, the end of your educational adventure for the day. Hopefully you've picked up some knowledge along the way. Vicki L Beyer, a regular Japan Today contributor, is a freelance travel writer who also blogs about traveling in and otherwise enjoying Japan. Find her blog at jigsaw-japan.com.